Play the Vegas slot with the most win lines anywhere – now on Gaminator! You think you got the hang of handling win lines? Well, step up and prove just how good you are at keeping track of classic Vegas slot icons spinning on 5 reels and across up to 40 win lines! Mega Joker™ will test your stamina and your skill like few other slot games on the web! 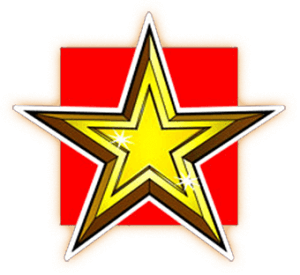 The golden Star is the Mega Joker™ Scatter-symbol. If the Scatter symbol simultaneously shows up five times on any line at the same time, you will be rewarded with 400 times your bet! The Joker is the wild card of the Mega Joker™ game. The Joker will substitute for any other symbol on the reels of the game. Enough lines for hours of fun! Just taking a look at the paytable in Mega Joker™ will blow your mind! All kinds of fruity symbols will have you reminisce about the old days of Vegas fun long gone, while still keeping you busy with new mechanics of the latest generation! This is the most popular slot game for newcomers to the genre. No other machine offers this many payout variations, and certainly this many win lines, and coupled with precisely adjustable stakes Mega Joker™ is simply the perfect mix for all new players. We cannot recommend it enough! 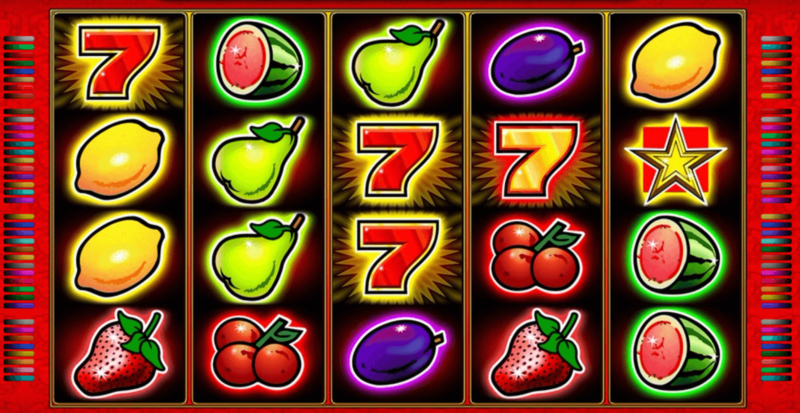 Plums, oranges, lemons, and cherries are the most common symbols occurring, with their multipliers being the baseline for this exciting slot game. 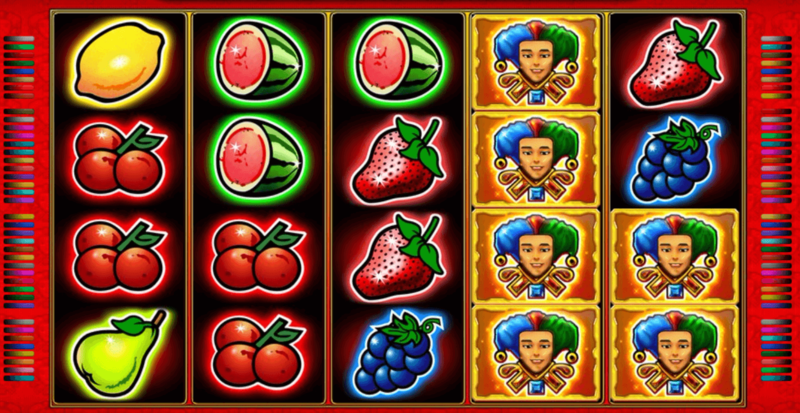 Grapes and watermelons appear slightly more rarely and net you slightly higher multipliers. Strawberries and pears can be considered royalty in the fruit hierarchy, with even higher stake multipliers. The trifecta of high-paying symbols begins with two sevens, gold stars and the big Joker symbol. The Joker himself is the wild symbol of this slot machine, replacing all other symbols along the many win lines and across the reels. Once three of them show up you immediately receive your bet as round winnings. 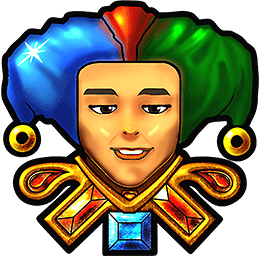 Four Jokers get you your bet times five, and if you are lucky enough to gather 5 Jokers you will be rewarded with 40 times your initial stake! The Joker can also “progress” during several rounds, stacking up along the reels, further increasing your chances at a big win! Golden Stars are the scatter of Mega Joker™, getting you the biggest possible single payout – if you get the stars to align right so to speak. Five of the golden symbols will get you a fat x400 multiplier, the highest possible win in the game and, considering the sheer mass of win lines in this slot machine, also potentially the biggest single round payout you might ever score on Gaminator! Have we already explained just how good this machine is for new players? We’ll get to it gents! To keep things simple and frustration at a minimum, we kept the gamble feature away from this glorious slot game. No point risking your winnings, instead, you get to focus on experimenting with the number of win lines you want to play with, and begin to develop a feeling for the entire genre of casino gaming. We won’t tell you how to play but please, let us at least point you in the right direction. One of the best online slots ever is right here, and you will never get as many win lines as you can play with here! Gaminator brings you only the best online slots! The Gaminator Social Casino welcomes its community with a completely revamped page and one of the best assortment of online slots you could imagine. High-resolution graphics, hi-def sound effects, and 100% original Novomatic quality mean you get to focus on enjoying awesome Vegas slots and all the thrill playing slots can bring you. 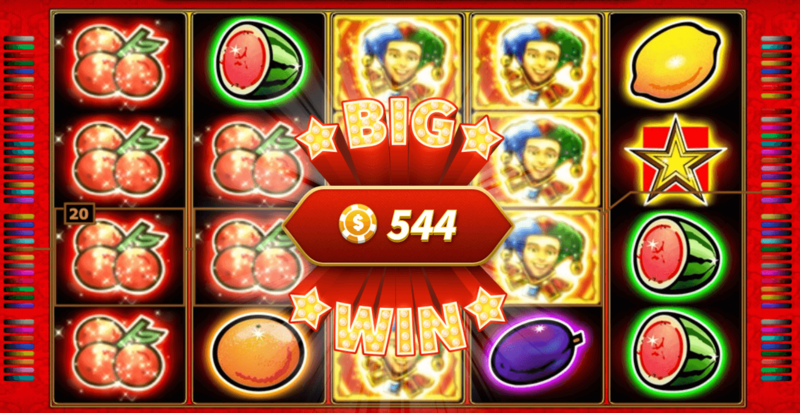 Mega Joker™ is just one of the many quality slots you can play on Gaminator entirely for free!